When I was invited to a road trip to Anuradhapura and Polonnaruwa by one of my friends, I had my doubts whether will it be interesting as I have visited those places many times in my childhood. But when he told me that two foreigners along with another Sri Lankan friend will join, I couldn’t resist. I’ve always wanted to travel Sri Lanka (at least a part of it) with foreigners and see it through their eyes, experience the difficulties they face. Therefore, I gladly confirmed my participation. My friend came all the way from Kurunegala by his car and picked me up from Kandy around 8.30 am. We went straight to Dambulla and had some short eats for breakfast. Then left to Sigiriya. Other three participants were on a two week long trip, which started on the previous week and we joined them at the place they spend the last night at Sigiriya. We had a cup of tea while they checked out. Then headed to Anuradhapura. We talked about their travel experiences in Sri Lanka on the previous couple of Days and they were really friendly. It was about 11am when we reached Anuradhapura town. We all were hungry and decided to look for a good place to eat. Once we stopped the car and got out, we realized how hot it was. We quickly went in to the nearest restaurant and luckily we had a tasty Brunch and appreciable service there. Around 11.30am we got back in to the car and started driving through the complex road network, in search of the Anuradhapura Old (puja) Town. Being three out of us five are locals, it was hard to find the ticketing office for foreigners. We saw “Isurumuniya” name board and parked the car. Though I have visited Anuradhapura few times in my childhood, I haven’t been to Isurumuniya before. So I was excited as much as our two German friends! It was early May and we felt like sun have came closer by few light years. As it was a temple, we had to remove our shoes and hats. The floor was burning hot so we darted to a shady corner inside the premises. There wasn’t much to see in the left side so we went in to the “Vihara geya”. There are some paintings in the ceiling. We saw two famous stone carvings called “Man and the horse head” and “Elephants playing in the water”. There are few explanations about the “Man and the horse head” carving, but the famous idea is a soldier resting with his horse. The elephants were carved in the bottom of the rock, just above the water. So it seems the elephants are playing in the pond. It was too hot to walk outside. One of us was holding a shawl over the head to cover the unbearable heat. One of the guards screamed saying that it is not allowed inside the premises. Knowing the teachings of lord Buddha, we decided it is not worth to spend our time explaining it to him and went to a shade near the entrance. There we met a local elderly female who quickly became friendly and expressed her worries about not providing a reasonable service for foreigners for the money they charge to visit Anuradhapura Puja Town. We came back to the car park and went to the “Jaya Sri Maha Bodhi”, a sapling of the Bo tree which gave shade to Lord Buddha for Enlightening. There were many fences with gold plating around the “Bodhi” and a stone outer wall. Normally it is not allowed to go inside those fences, so we walked around the the “Weli Maluwa” observing the pilgrims worshiping the sacred tree. Surprisingly it was much cooler under the “Jaya Sri Maha Bodhi” and we spent some time there before going back. With the not being able to bear the rays of mighty sun, we decided to go back to our accommodation (A Circuit Bungalow of my friend’s Company) and come back in the afternoon. After a shower we went straight to a nap, woke up around 3pm for our evening session. But the sky was gloomy and we hurried to cover all the places before a heavy shower. On the way back we located the tourist information center in google maps and contacted the telephone number. The three of us Sri Lankan were embarrassed as a lady answered the call and explained that it is not an information center, but her house. There was no direction alongside of the road about the tourist ticketing counter either. So we followed google maps for the tourist information center. Unfortunately the rain started and we were forced to go back to our accommodation by the half flooded roads and lightening. So it was time for us to re-plan the itinerary. As our German friends needed to visit the remaining places in Anuradhapura, we thought it is best to cover Anuradhapura in the next day morning quickly as possible and then visit Polonnaruwa via Aukana in the evening. We had an early dinner and went to sleep as soon as we could. We woke up in the morning and had our breakfast from the place we stayed. Food was tasty but we quickly finished it to start our visit. As we inquired from the Circuit keeper, he directed us to the Jethawanaramaya Museum where we could purchase All-in-One Anuradhapura Ticket for our German friends. We quickly covered the museum and went to the mighty Jethawanaramaya by the vehicle (You also can walk there, but the distance is considerably high and we were in a hurry, so we used the car). It was amazing to imagine how things were at those old times while walking around them. Then we went to the Ruwanweli Seya, The Pagoda made by king Dutugemunu. Folklore reveals that even The king himself contributed the construction by bringing up bricks. In the final stages of the construction, Younger brother Saddhathissa takes over the project as King Dutugemunu falls sick. At the deathbed King Dutugemunu requests to see the completed pagoda. As there was not enough time to complete it before the great king dies, Prince Saddhathissa covers the uncompleted parts of the pagoda by white linen and take the king there. It is said that the king believed the construction was over, Worshiped the pagoda just before his last breath. At the time we visited there was a “Kap-ruk Pooja”, an offering of linen to the pagoda and it was getting crowded as it was two days before Wesak holidays. Between Ruwanweli seya and Sri Maha Bodiya (which we visited the day before) there is another special location called Lowamahapaya. Though now there are only ground level stone pillars left, It is said that there were a nine story building with a Bronze colored roof (hence the name, Lowa-Maha-Prasadaya) which remained the tallest building of the country except the pagodas Ruwanweli seya, Abhayagiriya and Jethawanaramaya between 155BC and 993AD. This building was destroyed by the attacks during the reign of King Saddhathissa and he had reconstructed it with seven stories. Our next stop was the Abhayagiriya Complex, which was used as a college to Bikkhus (Buddhist Monks) in the Anuradhapura era. Therefore, the ruins are spread around a vast area. Credit of Abhayagiri Pagoda construction goes to the youngest son of King Saddhathissa, king Walagamba ( 103 BC, 89-77 BC). As soon as he came to the throne there was an Indian Invasion which he couldn’t withstand, he retreated. At that time there was a Jain Shrine in this place and it is said the priest named “Giri” insulted the King “Here the great black Sinhalese King is retreating”. It took another 14 year for King Walagamba to defeat the invaders, but when he did He built this giant Stupa on the location of that Jain Shrine and named the Pagoda by combining the King’s name (Abhaya) and the Jain Priest’s name (Giri). After that we went to the “Samadhi Statue” of Lord Buddha. It was wonderful to see how the craftsmen have finished the live-like stone statue. It is believed there were four statues like this around a Bodhiya (Bo Tree), but the tree and other three statues are destroyed. Then we stopped at “Thuparamaya” which is considered as the first Pagoda constructed after introduction of Buddhism to Sri Lanka. This was constructed by King Devanampiyathissa, enshrining the color bone of Lord Buddha. As the name reveals Thupa (Pagoda) + Aramaya (Where monks reside), there are ruins scattered around the pagoda which are suspected to be the roof for monks. With Thuparamaya, we finished our Anuradhapura tour and started our journey to Polonnaruwa via Awukana. It was around 12 pm when we reached “Awukana” after a long ride on countryside roads. The name “Awukana” means “Under the harsh sun rays”. The Standing Statue of Lord Buddha was constructed during the reign of King Dhathusena, Father of King Kashyapa (who resided in Sigiriya). Recently a roof over the masterpiece of skillful Sri Lankan craftsmanship has been constructed, but as our German friend highlighted it obstructs the grand view. It will be better if the roof height can be increased, but don’t know about the feasibility. They charge 1000LKR from foreigners just to see the statue. Sadly it would have been better if they could do some value addition to the visit at least like a Ticket with the Image of Awukana Statue with related information for the price foreigners have to pay. We brought some biscuits from a nearby shop, so we can wait until we reach Polonnaruwa for Lunch (A very late Lunch) . On the way back we slowed down a bit to capture the breathtaking view over the waters of “Kala wewa” which was also constructed and treasured by the King Dhathusena. It was around 3.30 pm when we reached Polonnaruwa. One of our friends had recommended a place to have the lunch, so we tracked the location. Google maps directed us along a narrow road off the main Road (A11) in between light green paddy fields. When we arrived the place, all we could see was a garden adjacent to a house and a young man working with some banana trees. We were worried that this must be a wrong place, but gladly the he confirmed that it is “Jaga Food”. We got a warm welcome and he ushered us to the restaurant i the back of the garden. It was an open area next to a pond with visitors’ comments all over on the ceiling. Though it was very late for lunch, they had their Lunch Buffet open. It was one of the tastiest rice and curry buffets i have been and they had Curd & Trickle, Papaya and Sri Lankan Pan cakes (A yellowish pan cake wrapped around a lump of pol pani – a coconut and trickle mix). Our hungry tummies as well as the souls were filled with their delicious food and hospitality. Our German friends took a minute to made a comment on their ceiling and we hurried to Polonnaruwa town after thanking Jaga and his wife. 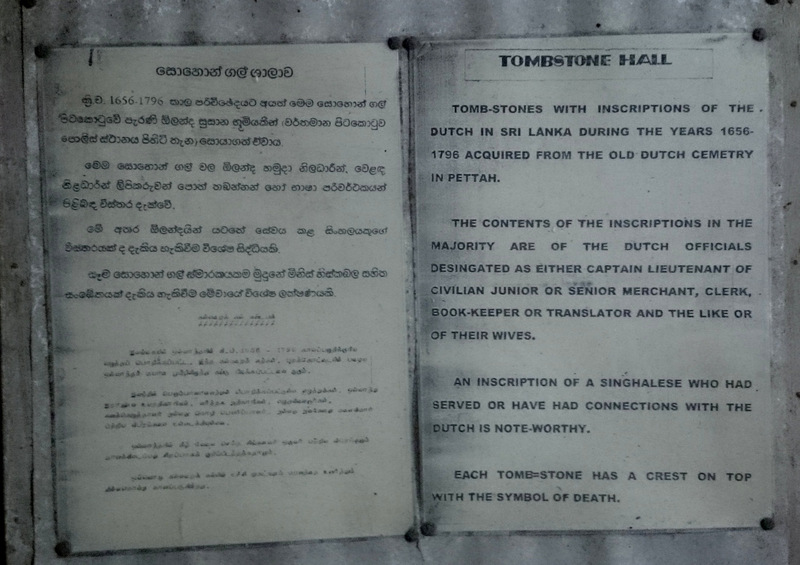 It was easy to find the Pollonnaruwa ticketing place at the Archeological museum as Jaga gave us the directions. Pollonnaruwa ruins were fairly located near to each other and we could access them by a vehicle (must-walk distance is very low). First we took a right turn as we entered the from the gate to visit ruins of the palace called “Vaijayanthi Prasadaya” of King Parakramabahu the first (1153-1186 BC). The main building is said be of seven stories and consisted of 1000 chambers but there is only signs of three stories and 55 chambers at present. South Indian invader called “Maaga” had set fire to this palace to destroy and you still can see burn marks on the brick wall. There were numerous remains of the royal palace scattered around and we were amazed to see that the drainage network of that time is still in good condition. We walked along the ancient paved pathway to visit the “Kumara Pokuna” (The royal bathing Place). It is said that this was constructed by King Parakramabahu, in his garden called “Nandana Uyana” which was below the level of palace. A nearby canal was used to bring water and poured into via two sprouts made like “Dragons”. Then we moved to the next ruins cluster, which is to the left from the main entrance. “Thivanka Pilimageya” is an image house as the name implies which was constructed by King Parakramabahu (1153-1186 AD). “Thivanka” means bent in three places,and the Buddha statue in here is bent from the Shoulder, Hip and the Knee (This pose is common in the guard stones). The Buddha statue is believed to be about 8m in height but now it is less as the part above the head has been destroyed. Interior wall of this building is decorated with Polonnaruwa era paintings of “Jathaka Katha” and Incidents from the life of Lord Buddha while the exterior walls are decorated with various stone statues. It was so dark inside the building at that time, so i couldn’t take a good picture of the statue and paintings inside. “Watadageya” is in front of Thivanka Pilimageya and it is a Round (Wata) Stupa (Da) House (Geya). There are few “watadageya” s in Sri Lanka. Polonnaruwa Watadageya is considered the best remaining of it’s kind. Madirigiriya and Thuparamaya (both in Anuradhapura) are other best examples. 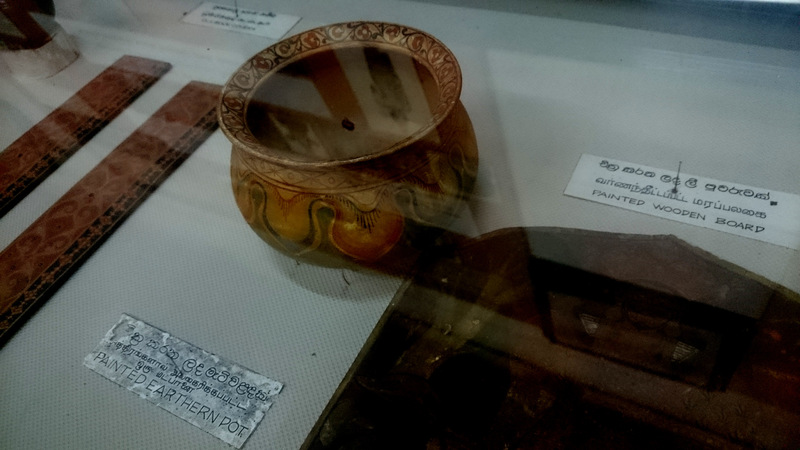 This is believed to be constructed by King Parakramabahu to safe keeping of the Tooth Relic or a work of King Nishshankamalla to hold the “Pathraya” (Alms Bowl) of Lord Buddha. A stone fence with very detailed designs and columns covers the inner brick wall which encloses the Stupa and Buddha Statues. Then there is “Atadageya”next to it, which once hold the sacred Tooth relic. This said to be a two story building constructed by King Vijayabahu the First. There is another more closed sturcture called “Hetadageya” adjacent to “Atadageya”. There is a Stone Door frame with very deatailed carvings and the stone walls have inscriptions. Walls are believed to be decorated with frescoes and carvings. This building too had multi stories and the remaining section of stair case is still in good condition. Finally we visited “Sathmahal Prasadaya” at the same site. As the name Sath (seven) Mahal (Story) Prasadaya (Building) implies there are seven stories to this building (Which are still can be seen). This is said to be a Square shaped Stupa, which is very rare in Sri Lanka. Then we drove to the Pollonnaruwa Gal Vihara complex car park under the gloomy dark sky. It started to drizzle as we walked towrds Gal viharaya but as it was our last stop, we didn’t care to wait till it stops. The distance we had to walk is less than 500m. There are four Granite Statues of Lord Buddha in all three poses. One large statue in seated pose adjacent to a smaller similar statue inside a “Kuti” (room) called “Vidyadara Guhawa”. A standing statue and a reclining statue. The place said to be called “Uththararamaya” andconsidered to be a work of King Parakramabahu the First. Recently a roof has been constructed over these figures in order to protect them. We couldn’t spend much time there due to the rain and we came back to the parking lot and started to drive back home. We reached Kandy around 9pm and our foreign friends stayed with the plans to visit Kandy on the next day. 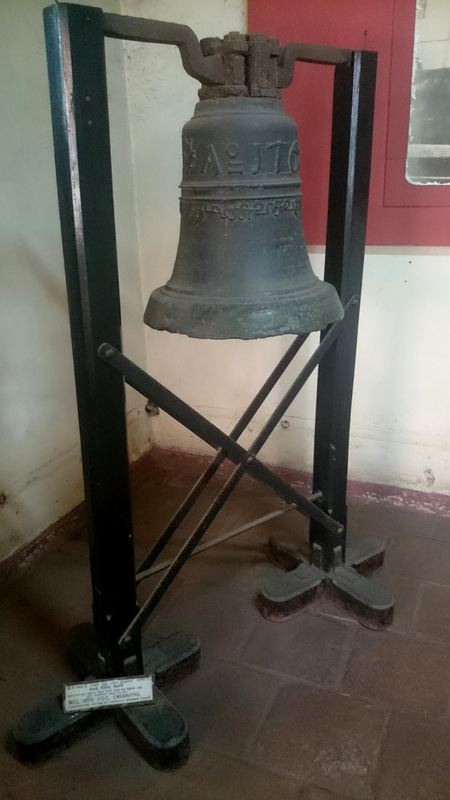 Read about our visit to Kandy. One of my friends invited me to join for a Hot Air Balloon ride. I was surprised by the invitation as i thought it was a bit unaffordable luxury, and immediately inquired about the cost. It was way cheaper than i was expecting, so i confirmed my participation without a hesitation. The Balloon ride starts early in the morning, so me and few other friends thought it will be best to go to Dambulla on the day before. Three of us came from Colombo directly to Dambulla by bus. The one who invited me, drove his car all the way from Kurunegala and picked me and another one from Kandy. We all reached Dambulla around 2.30 pm and decided to have a late Lunch. It took us more than an hour to finish the lunch as we were busy talking, than eating. We had reserved a place in Dambulla for six of us to stay, and it took a while to figure out the exact location. It was a hot evening in Dambulla, so we rushed in to the rooms and turned on the AC’s. It was around 7.30 pm when I finished resting and had a shower. It was time to search for a place to have dinner! We walked to Dambulla town under the faint street lights. The streets were less crowded, but there were few long distant buses waiting for passengers. We settled for a place with privacy and Air condition after checking out few other restaurants. They offered the menu and we had a very hard time deciding what to eat. But when we are going to place the order, the waiter said there is only Fried Rice and Noodles! So we had to select again, but it was easier to pick one out of two. When we were going back to the hotel, I met an old lady selling “Pera” (Guava) outside the restaurant. I was wondering, are there anyone interested in buying Guava from the street around 9pm. I felt bad for her and bought one. We had to take showers again after the walk and felt asleep as soon as head hit the pillow. The alarms rang and I woke up within a second with the excitement for a ride of a lifetime. We were ready by 5am and the guys from “Sri Lanka Balloon” contacted us to inform that they have arrived to the Hotel gate. We hurried in to the van. They picked up two foreigners on the way and started driving on a narrow road towards a village. Soon we saw a Lorry, carrying the basket of the Balloon. It was the first time for all of us to see a Balloon, so we focused our excited eyes and cameras for a glimpse of that through the darkness. The take-off point was a school ground. The rest of our team arrived there by two cars. One was from Colombo and the other one from Kandy. There were 13 of us in the team, five girls and eight boys. We completed the payments before take-off and watched the crew working hard to prepare the Balloon. There were two Balloons, one for us and another one for few foreigners. It took two lorries to carry the basket and the Inflating part of a Balloon. They assembled them together and started filling air with portable industrial fans. Our pilot then took position in the basket and blew “Hot Air” in to the Balloon. It only took about 15 minutes to fill the balloon with air and we were asked to jump in to the basket. With another shoot of gas in to the Balloon, we were ascending over the trees. It was a gentle take-off and no one was afraid at that moment, though we have analyzed the risks earlier. Still the sun was sleeping and sky was dark. Within few minutes we were about 700 meters high and watching the very first rays of sun light over the Kandalama Lake. That was a breathtaking scenery to watch, up from the sky. We all were busy with our cameras to capturing that awesome moment. Our Turkish pilot, Umit was very friendly and shared his experiences and showed photos of his Balloon rides in Turky. There were another two Balloons in the sky with us. We had to spend some time over the Kandalama Lake as there was less wind to carry us away. We saw people coming out of the houses to have a closer look at the Balloons floating over. Though ballooning has started some time ago, most of the villagers were excited to see us. We saw the lorries (witch brought the balloon to the take-off point) were following the balloon. Umit said that as the pilot can only control the vertical movement of the balloon, the landing destination depends on the wind at that time. We were able to see Dambulla Cave Temple, Sigiriya and Pidurangala from the distance, after the mist faded off. After about 1.5 hours we were floating tree height in search of a good landing place. We were able to pick the leaves from top of the trees and wasn’t afraid of a crash landing as we saw how skilled our pilot was. I was hungry at this point and was glad that I took the Guava (that i purchased last night) with me. It was tasty and I regretted not buying more. There was an empty space between few houses near a road. Our pilot descended the balloon about ten feet high above the ground and threw the Sand bag attached to the basket by a rope to the crew in the ground. They pulled the rope and tied it. The landing too was gentle and we didn’t feel a thing. The crew asked us to stay in the basket and the pilot opened the top part of the balloon to let the hot air out. Then we came out and the crew was busy folding the balloon. There were around 20 people staring and photographing our landing. The Crew gave us small gifts to distribute among the village kids and we felt like celebrities! After few minutes we gathered in a nearby open space, There was a Champagne to celebrate, and soft drinks. There was an action camera hanging from the side of the balloon and they were recording our ride. We purchased the video and received certificates for the balloon ride. It was around 8.30 in the morning and they provided transport back to our hotel. We quickly packed our bags and checked-out. Our next stop was the place we had brunch yesterday. The Breakfast was tasty and we had a lot to talk about until 10.30 am. Then we decided to visit Sigiriya, the rock fortress of King Kashyapa and came back to Kandy around 5.30pm. When i am searching the internet for places to visit near Colombo, one of the results showed me ” Colombo Dutch Museum” and i was curious. I haven’t been heard such thing existed in Colombo. 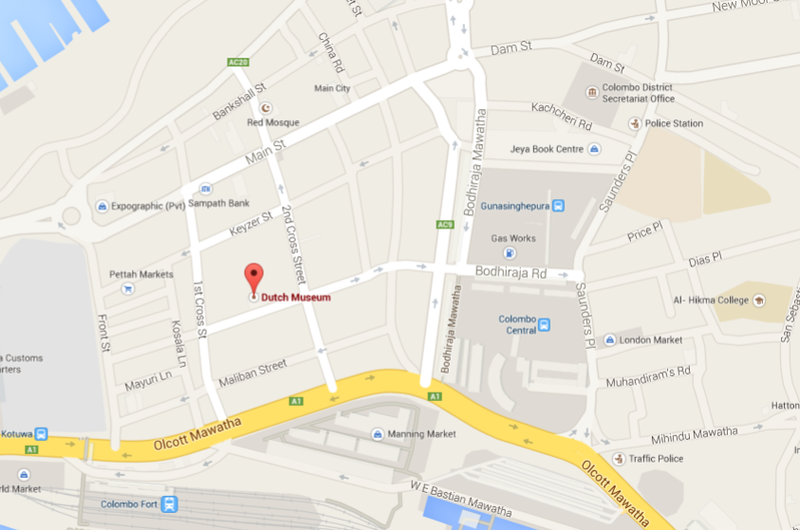 Plus when i searched for the location, Google map pointed in the middle of the busiest site in Colombo, Pettah. I was too interested to visit, so i decided to go there in a Saturday morning. It was around 10.30 AM when i reached to petteh and it was easy to find the way among busy crowd with the help of Google maps. It was easy to identify the calm and spacious corridor of the museum in the middle of crowdy and noisy “Prince Street”. There is a ticket counter at the entrance. Ticket Price is 20 rupees for a Srilankan adult, which is extremely cheap. There were some curators at the entrance (You can use there help if you want), But i preferred going through the Artifacts all by myself.Introduction to the era and general information was displayed at the very first room where we enter. The Maps before and after dutch rulers, Introduction to religious, cultural and governing structure changes are some of the attractions i saw in the first two rooms. 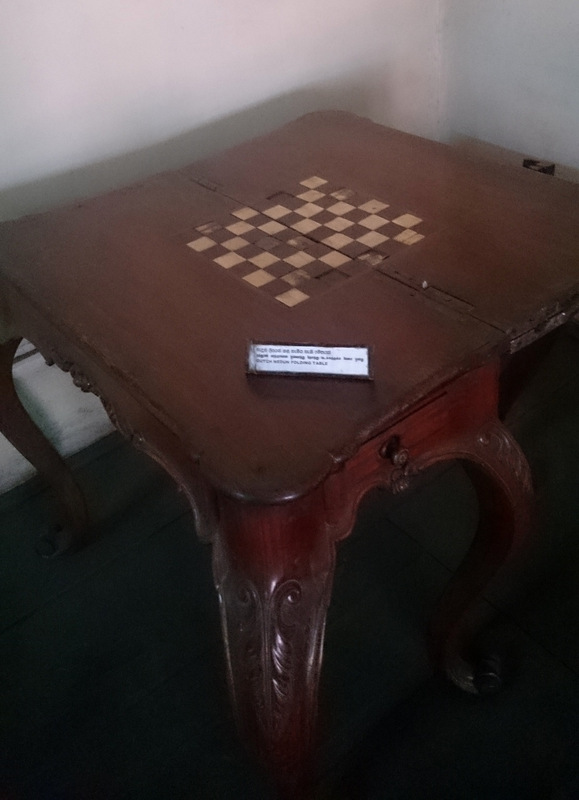 There were many Wooden furniture with designs influenced by dutch culture and ornaments like chandeliers, jewelry boxes and Cutlery were displayed. The Garden of the building was preserved and the well on the side is a major attraction. It took around 1.5 hours for me to cover all the exhibits.